During the night time, we see many stars. Only around three thousand are visible to us. But actually there are many crores of stars in the Universe. Astronomical scientists observe and do research on them. Recently they have discovered a new star. They got surprised by the results of computations and analysis done on the star. It is the massive star known to us. Its mass is 265 times to that of the mass of Sun. Moreover it is brighter than Sun by 87,00,000 times. That means Sun light becomes dull before it just like the Moon before the Sun. Sun’s brightness does not count at all before the brightness of it. The massive star discovered, is named as R136A1. Now scientists are doing a lot of research on it. By doing research on it, there might be the chance of getting more information about the evolution of stars, planets and other heavenly bodies in the universe. When the scientists are observing the distant stars through the big telescope in Chile, they found this star. Moreover, some more information and details are recorded in the moving Hubble telescope. It is surprising to know that it is such a massive star. But it is 320 times more massive than Sun at the time of its birth. Hydrogen gas present in the stars is responsible for their emission of light and brightness. This massive star is consuming its hydrogen gas very quickly. It became a middle aged star with in 10 lakh years. But it has been 500 crores of years since the birth of Sun. Hydrogen fuel is available in the Sun for another 500 crores of years. 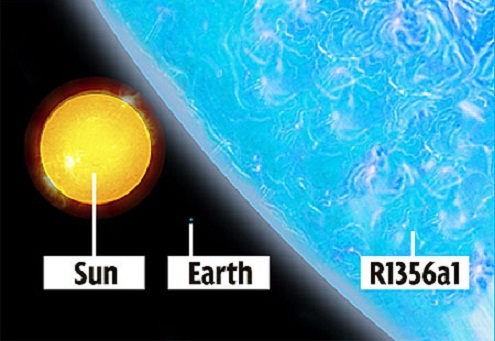 Another surprising fact is the brightness of R136A1. Based on the information known to us, any star with brightness about 150 times to that of the brightness of the Sun would burst. But this assumption became false in the case of this star. Moreover this star is farther from the Earth by 1,65,000 light years. It lies in the Tarantula galaxy. A light year is equivalent to 9,45,000 kilometers. From this one can understand how far the star is from the Earth.